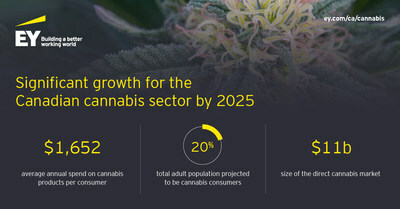 TORONTO, March 26, 2019 /CNW/ - One-in-five Canadian adults are expected to be cannabis consumers by the year 2025, according to EY analysis. Consumers are projected to spend an average of $1,652 on cannabis products annually—up by 30% from $1,263 this year. "There's an argument that as legal cannabis prices increase so is spending in the illicit market, and that's not completely true," says Zachary Pendley, EY Canada Cannabis Real Estate and Valuation Leader. "The reality is that retail and distribution frameworks across Canada have been implemented much slower than anticipated, pushing many consumers to look for alternatives. As the industry matures, access to product eases and higher margin derivatives come online, we'll see a rise in consumer spending on legal cannabis." 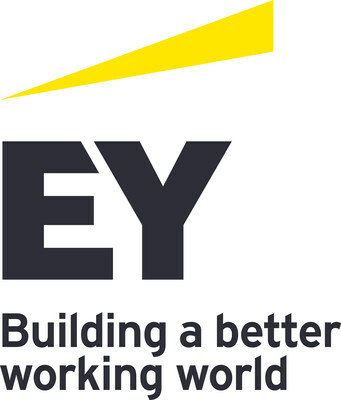 EY analysis indicates that if current and planned facility expansions of over 14+ million square feet are completed and licensed in a timely manner, the supply of cannabis production in Canada will outpace demand in less than five years. This will increase competition and drive down commodity prices, resulting in the average wholesale price for dried flower to likely be between $4-$5 by 2025. However, achieving this level of supply requires significant capital investment, which can be more than $250/ sq ft.
Research shows that the Canadian direct cannabis market will grow 50% to $11 billion by 2025. Consumption will mostly be split between dried flower (46%) and extracts (37%), with a small percentage to edibles (12%) and non-edible derivatives (5%). "Despite projected growth, Canadian licensed producers still face a lot of uncertainty as they navigate an immature and undefined market," says Pendley. "Unclear regulations around edibles, for example, make long-term capital allocation decisions a challenging task. Managing these unknowns, coupled with rising competition, is putting more pressure on producers to maximize output in the most cost-effective and efficient ways." Pendley adds: "Canadian licensed producers should look to strategic joint ventures and partnerships as a way to navigate the regulatory landscape, access greater capital and enter new markets – both in Canada and internationally."